All transactions are safe and secure with a reliable history in online purchasing behind each of our associates. 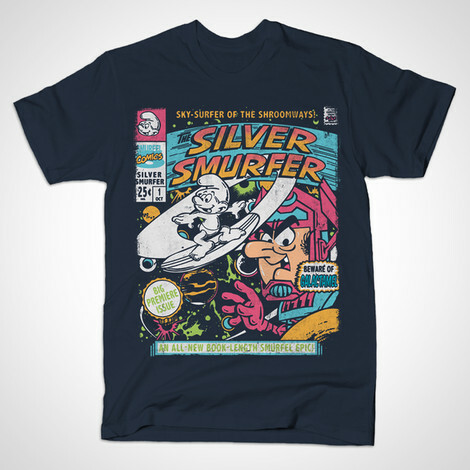 Buy The Silver Smurfer t-shirt to own Smurfs clothing and merchandise. These Smurfs tees creatively blend the iconic little blue guys with the Silver Surfer superhero comic to create The Silver Smurfer. Here, the antagonist Gargamel has become Galactamel, and the hero is described as the "sky-surfer of the shroomways". Wear it as you imagine yourself helping the smurfs take on their foes. If you would like to create your own smurfy scene live, check out the Smurfette costume displayed above. In addition to The Silver Smurfer tee above, browse the Smurfs Clothing Gallery for more apparel like men's and women's clothes, kids shirts or hoodies.